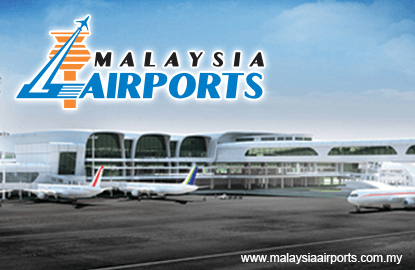 KUALA LUMPUR (July 28): Malaysia Airports Holdings Bhd (MAHB) reported a net profit of RM9.38 million for the second quarter ended June 30, 2016 (2QFY16) against a net loss of RM19.88 million a year ago, mainly due to a significant drop in finance cost. The group narrowed its loss per share to 1.21 sen from 3.2 sen previously. In a bourse filing today, MAHB said the improvements were due to higher revenue and lower total cost but negated by lower other income. It said the decrease in cost was mainly due to lower finance expenses by RM59.5 million or 56.4%. As for other income, MAHB said it was because the group registered a gain arising from the disposal of its stake in Delhi International Airport Pte Ltd (DIAL) last year. DIAL is the operator of India's Indira Gandhi International Airport. MAHB sold its 10% stake in DIAL for US$79 million (about RM320 million) to GMR Airports Ltd last year. Meanwhile, higher revenue was attributed to higher passenger growth, more point to point passenger movements, consolidation of operations at Kota Kinabalu International Airport (KKIA) as well as the relocation of Malindo Airways Sdn Bhd to Kuala Lumpur International Airport. For 2QFY16, MAHB posted revenue of RM997.6 million, up by 6.13% from RM939.96 million a year ago. MAHB declared a single-tier interim dividend of four sen. Its ex and payment dates fall on Aug 10 and 26. In the six months ended June 30, 2016 (1HFY16), MAHB's net profit more than doubled to RM26.39 million from RM12.24 million last year, while revenue grew by 11.06% to RM2.02 billion from RM1.82 billion in 1HFY15. Moving forward, MAHB noted that the recent events globally and locally including Islamic State's threats have added some uncertainties and pose some downside risks to air travel. "Nevertheless, MAHB anticipates its final passenger numbers for Malaysia would at least meet the estimated 2.5% growth for 2016. The international growth will likely outpace the domestic growth. This is based on the premise that the current unfavourable conditions would not worsen," the group explained. MAHB also mentioned that its Istanbul Sabiha Gokcen International Airport passenger traffic merely grew by 6% in 2QFY16, compared to 16.5% a year ago. "The lower growth was due to the recent geopolitical events in Europe and Middle East which has posed some challenges to the aviation industry," it said. Nonetheless, the group remains confident of the long-term growth prospects of its operations in Turkey. "The economic fundamentals of the group's investment in Turkey remains strong with more focus on further revenue optimisation and operational efficiency to facilitate growth," MAHB said. At 2.31pm, MAHB was trading eight sen or 1.36% lower at RM5.82, giving it a market capitalisation of RM9.64 billion.